Visitors queue outside TASCHEN’s Neumarkt store waiting for Christo. Christo and Benedikt Taschen Christo signs a copy of The Floating Piers. A copy of Christo and Jeanne-Claude waiting to be personalized. Journalist Wibke von Bonin (right) and guests browse through the newly released Albert Watson Collector’s Edition. The store’s interior designers Alberto Stampanoni Bassi and Salvatore Licitra, grandson of Gio Ponti. Photographer Benjamin Katz holds up a picture of the first ever TASCHEN store. 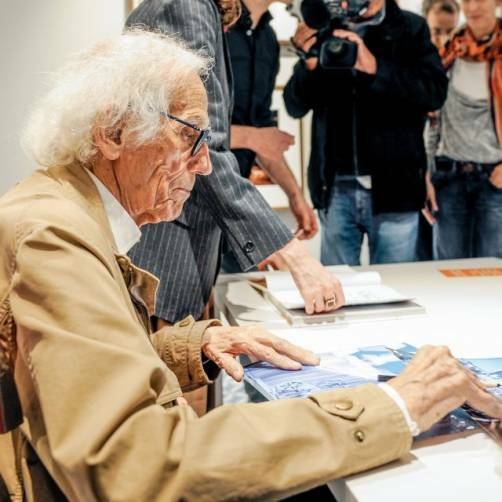 On Thursday 21st September, a day after opening its doors, TASCHEN Store Cologne welcomed its first guest of honor: the legendary Christo. 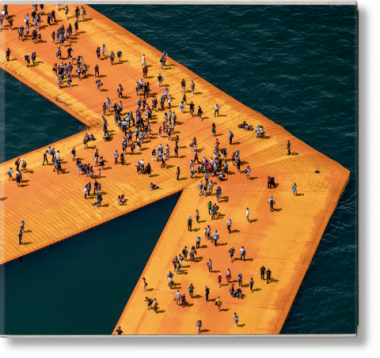 Hosted by Benedikt and Marlene Taschen, more than 800 fans queued around two blocks for a chance at a signed copy of Floating Piers and Wrapped Reichstag. The luminary artist behind such projects as The Gates, Surrounded Islands and Valley Curtain was also interviewed the German morning daily ARD/ZDF Morgenmagazin. Christo shared anecdotes of his time starting out in Cologne in the 1960s, a city he has always held in his heart, as reflected in his project My Cologne Cathedral, Wrapped.